Welcome to our media coverage page! Here you can read all about our achievements in magazines and publications. We have been featured in a variety of issues such as Turf Magazine, HNA Awards, The New Jersey Landscape Contractor Magazine, and many others. Feel free to read about us in our articles below. The 2008 recession did many things to change people’s lives, and one of them was to cut into family travel budgets. The staycation was born, and with it the idea that it might not hurt to fix up the backyard and invite in some friends and neighbors. Central to that is the outdoor kitchen – a concept that hasn’t been dampened a bit by the improving economy. And, yes, those outdoor kitchens (and accompanying wet bars) frequently incorporate hard-surface countertops. While most stone-fabrication shops take the big plunge into the hardscape business by installing pavers and veneer, there’s still a huge opportunity in outdoor countertops. The trick to tapping into the market is finding landscape designers and contractors and becoming a go-to source. Joe Monello, owner of Monello Landscape Industries LLC in Wayne, N.J., is another fan of a leathered finish, and he says he tries for a very natural look to his countertops. Last year, Joe Monello, owner of Wayne, New Jersey-based Monello Landscape Industries LLC renovated 11 facilities for commercial client CareOne, a company that owns more than 70 acute nurding and assisted living facilities in Massachusetts, New Jersey, and Virginia. The renovations included outdoor kitchens kitchen and entertainment areas, water features, shade structures and plenty of seating. the company also added a second, large water feature near each facility’s front entrance, as well as a sensory garden. This facility in Hamilton, New Jersey, used Techo-Bloc’s Blu 60 mm slate walkway pavers — a smooth surface for wheelchair users. The seat walls are Techo-Bloc’s Mini-creta, and EP Henry’s veneer over concrete block was used for the outdoor kitchen and seating bar. Shade is created with the pergola by Fifth Room, and the water feature by Atlantis Water Garden adds tranquillity. Finally, comfortable furniture by Eastern Outdoor Furniture completes the outdoor living area. Joe Monello is not a man to rest on his laurels. The owner of Wayne, New Jersey-based Monello Landscape Industries LLC has some pretty good commercial clients, but he’s not taking them for granted. One of his best is CareOne, a company that owns more than 70 acute nursing and assisted living facilities in Massachusetts, New Jersey and Virginia. Monello Landscape not only does maintenance for CareOne facilities, but also renovates several of its landscapes each year. Last year the company renovated 11 such facilities. Monello admits that the renovation work always includes certain elements, such as an outdoor kitchen and entertainment area, a water feature, shade structures and plenty of seating. However, new for 2016 were a couple new landscape additions: a second, large water feature near each facility’s front entrance, and a sensory garden. At the 2017 Hardscape North America trade show, the U.S. and Canada hardscape industry honored the winners and honorable mention recipients of the 2017 HNA Awards for hardscape projects built between November 1, 2013 and June 30, 2017. The awards are the industry’s top honors for contractors designing and installing projects using concrete pavers, segmental retaining walls, clay brick, porcelain, and combinations of hardscape products. Awards were given to residential and commercial walkways, patios, driveways, commercial plazas, streets, and other applications. Spread across 16 unique categories, a total of 149 entries were submitted. The HNA Awards were produced by the Interlocking Concrete Pavement Institute (ICPI) and endorsed by the National Concrete Masonry Association (NCMA) and the Brick Industry Association (BIA). The awards were sponsored by Belgard and Pavestone Company. If you’ve ever wondered if practice really does make perfect, ask Joe Monello; President and owner of Wayne, New Jersey-based Monello Landscape Industries, who took home this year’s Hardscape North America award for “Combination of Hardscape Products – Commercial – Less than 20,000 square feet” for a nursing home courtyard project his company completed in Wilmington, Massachusetts. One entry from a different facility’s project in 2015 failed to garner even a nod from the judges. Even with just 15 projects under his belt, Monello says he’ll continues to fine-tune every one until it is perfect. Monello Landscape Industries continues to design, build, and perform maintenance for both residential and commercial landscape projects. The maintenance side of the business launched Monello head first into the nursing home and health care market. Their client, CareOne LLC, is a NJ-based owner of assisted (and senior) living facilities. They initially brought in Monello for some paver maintenance on a couple of patios at their facilities. The client had also mentioned a new fountain feature that would work in one of their new areas. 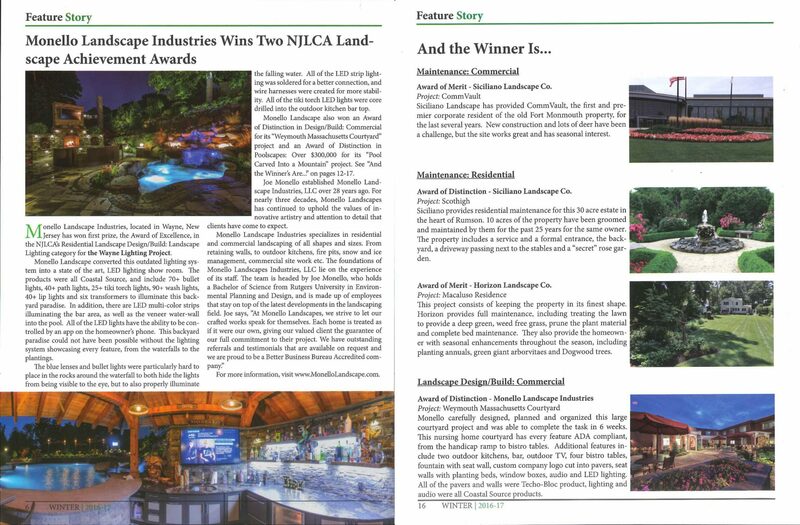 Monello Landscape Industries, located in Wayne, New Jersey has won first prize, the Award of Excellence, in the NJLCA’s Residential Landscape Design/Build: Landscape Lighting category for the Wayne Lighting Project. Monello Landscape converted this outdated lighting system into a state of the art, LED lighting show room. The products were all Coastal Source, and included 70+ bullet lights, 40+ path lights, 25+ tiki torch lights, 90+ wash lights, 40+ lip lights and six transformers to illuminate this backyard paradise. In addition, there are LED multi-color strips illuminating the bar area, as well as the veneer water-wall into the pool. All of the LED lights have the ability to be controlled by an app on the homeowner’s phone. This backyard paradise could not have been possible without the lighting system showcasing every feature, from the waterfalls to the plantings. The blue lenses and bullet lights were particularly hard to place in the rocks around the waterfall to both hide the lights from being visible to the eye, but to also properly illuminate the falling water. All of the LED strip lighting was soldered for a better connection, and wire harnesses were created for more stability. All of the tiki torch LED lights were core drilled into the outdoor kitchen bar top. Some spa owners might be jealous of the newly revamped backyard of a Wayne, NJ family: 5,000 sf of outdoor living space, complete with an elevated patio area, pool and hot tub lined with natural rock, a waterfall bubbling gently down from a walkway above, and a cozy fire pit tucked off to the side. The era of kiddie pools, Coleman grills and fold-up lawn chairs may be officially over. “Our backyard residential projects are all becoming high-end, and even people who are watching their budgets are asking for elements like fireplaces, outdoor kitchens and extensive living spaces” says Joe Monello, owner of New Jersey-based Monello Landscape Industries. The recent project in Wayne makes significant use of hardscape, with concrete pavers playing a major role. Four different sections on the project — dining, pool entrance, lounging and fire pit — each used a unique paver style to differentiate one space from the other, with a repeating border that brings the hardscaped area together aesthetically. To see our featured cover story, click the link below and go to Pages 10 – 15. The 7th Annual HNA Hardscape Project Awards announced fifteen winners and fifteen honorable mentions at an awards breakfast ceremony on October 25th at the Louisville Hyatt Regency. The HNA Hardscape Project Awards recognize outstanding hardscape projects by contractors building residential walkways, patios, driveways, and commercial plazas, parking lots, and streets. In its seventh year, the awards program received 100 entries. Entries were judged on project intent, design, quality of construction and craftsmanship, compatibility with related construction materials and systems, construction innovation, detailing and overall design excellence. 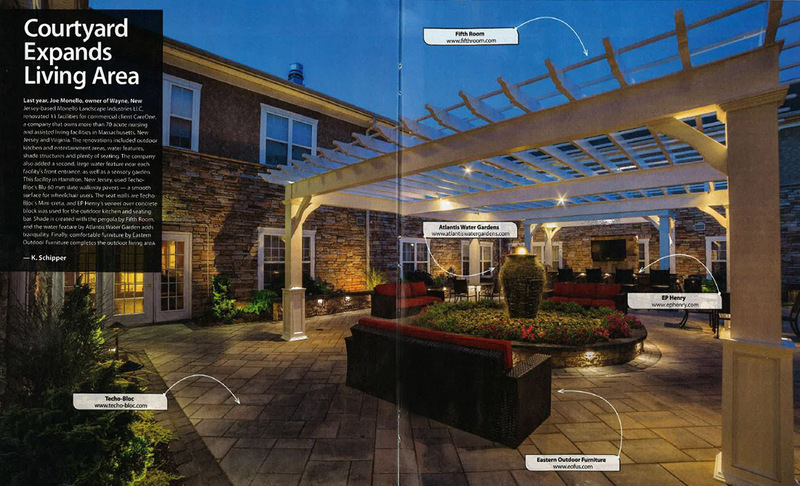 Monello Landscape Industries was featured in the photo of the award winners. To see our featured photo, click the link below and go to Page 8. Three Businesses Get A Green Thumbs Up! Ramsey – The Shade Tree Commission has been making the borough a little greener, one thumb at a time. The Green Thumb Awards have been presented yearly since 1993 for the best-landscaped and -maintained commercial properties in the community. Maldonado, co-owner of Fieldstone Fine Arts, along with Violet Laurenzo, said that it was a pleasure to win both the award and the recognition from the borough. While they both had a vision for what they wanted to accomplish, it was Joe Monello of Monello Landscape Industries who helped fulfill it.